Change alert: run_and_measure will return a dictionary of 1d bitstrings. Change alert: run_and_measure works with noise models now. What If I don’t want a topology? Let’s show how you can run a simple program on a QuantumComputer first we start with the relevant imports. We’ll write a function that takes a list of qubits and returns a pyQuil Program that constructs an entangled “GHZ” state. This is a generalization of the two-qubit Bell state. We can’t get the wavefunction from a real quantum computer though, so instead we’ll sample bitstrings. We expect to always measure the bitstring 000 or the bitstring 111 based on the definition of a GHZ state and confirmed by our wavefunction simulation. We’ll construct a QuantumComputer via the helper method get_qc. You may be tempted to use the QuantumComputer constructor directly. Please refer to the advanced documentation to see how to do that. Our program uses 3 qubits, so we’ll ask for a 3-qubit QVM. QuantumComputer.run_and_measure will run a given program (that does not have explicit MEASURE instructions) and then measure all qubits present in the quantum computer. Not a 2d array. 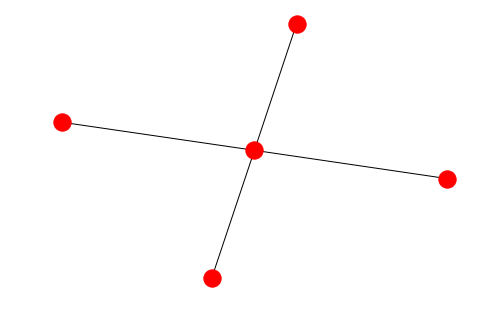 To demonstrate why, consider a lattice whose qubits are not contiguously indexed from 0. PyQuil 1.x’s run_and_measure would only measure qubits used in the given program. Now all qubits (per qc.qubits()) are measured. This is easier to reason about and reflects the reality of running on a QPU. When accounting for noise or when running QCVV tasks, you may be interested in the measurement results of qubits that weren’t even used in your program! In pyQuil 1.x, run_and_measure would not work with noise models. Now noise models are supported. Pre-configured noise models can be used via get_qc('xxxx-noisy-qvm'). As a consequence, run_and_measure for large numbers of trials will be slower in Pyquil 2. * guarantee not currently guaranteed. This is a work in progress. 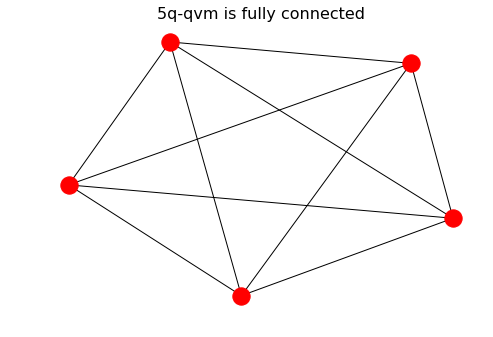 You can access a topology by qc.qubit_topology(), which will return a NetworkX representation of qubit connectivity. You can access the full set of supported instructions by qc.get_isa(). 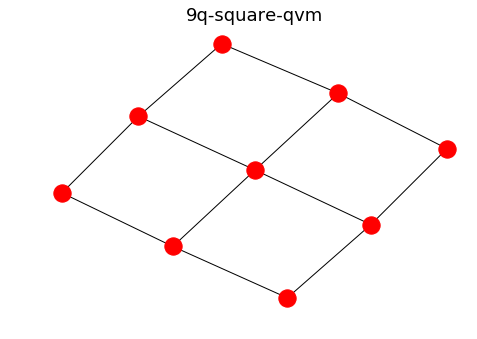 For example, we include a generic QVM named "9q-square-qvm" that has a square topology. WavefunctionSimulator still has no notion of qubit connectivity, so feel free to use that for simulating quantum algorithms that you aren’t concerned about running on an actual QPU. 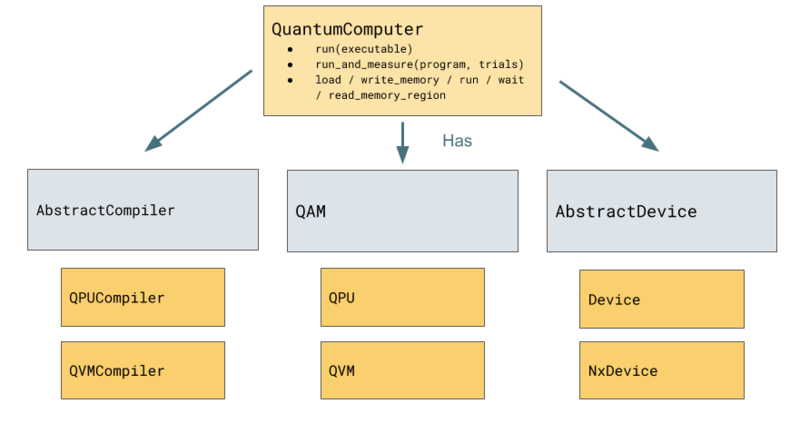 A QuantumComputer is a wrapper around three constituent parts, each of which has a programatic interface that must be respected by all classes that implement the interface. By having clear interfaces we can write backend-agnostic methods on QuantumComputer and mix-and-match backing objects. The following diagram shows the three objects that must be provided when constructing a QuantumComputer “by hand”. The abstract classes are backed in grey with example implementing classes listed below. Please consult the api reference for details on each interface. As an example, let’s construct a 5-qubit QVM with one central node and only even numbered qubits. © Copyright 2018, Rigetti Computing Revision a8631006.